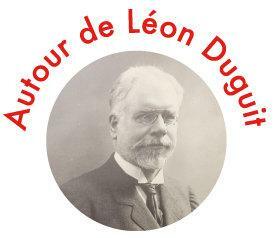 This article discusses and analyzes the sources and methods used by Leon Duguit in constructing the social-obligation or social-function norm of property as set out in an influential series of lectures in Buenos Aires published in 1912. The work of Henri Hayem has been underappreciated in the development of Duguit's ideas. Hayem should be restored as a central influence on Duguit's thought and as one of the main and earliest proponents of the idea of the social-function norm. The article also examines the influence of Charmont, Comte, Durkheim, Gide, Hauriou, Landry, and Saleilles in Duguit's thought on property and its social function. The treatment of issues pertaining to the personal and territorial reach of local statutes by Italian jurist Bartolus of Sassoferrato (1314-1357) has been widely regarded as foundational to the conflict of laws. This article presents a detailed examination of the Bartolan text and places it in historical and political context. It also establishes a working text and improves on previous English translations. The article approaches Bartolan thought from two angles. It considers the principal notions in modern doctrinal literature regarding Bartolan and medieval conflict of laws: was Bartolus a unilateralist? did he think in terms of territoriality or personality, form/substance, party autonomy or decisional harmony? Bartolan doctrine is also examined in the context of the legal and political environment of his time, notably with regard to the role of the ius commune and the transformation of medieval political structures. While Canadian legal education has undergone profound change over the past two centuries, the debate continues over whether learning the practice of law is best suited within the halls of academia or at firms in a professional or vocational context. “There has often been a drift between the profession and the academy where each has not been as respectful of what the other is doing — but they need to go together in combination,” says Brent Cotter, who recently stepped down as dean of the College of Law at the University of Saskatchewan (U of S) in Saskatoon. As revised in 1966, Rule 23 of the Federal Rules of Civil Procedure requires that class members in money damages suits receive notice and an opportunity to opt out. Class members in injunctive relief suits do not enjoy these procedural rights. No consensus explanation for this difference, which implicates the class action’s constitutional foundation, has prevailed. Using previously-overlooked primary sources, I provide a history of both class action doctrine before 1966 and the labors of the authors of the 1966 revision to determine why they structured the rule the way they did. The answer is startling. No purely procedural, trans-substantive justification exists to explain why they eschewed procedural rights for injunctive relief suits. Rather, the 1966 authors did so to assist plaintiffs prosecuting desegregation suits in the Deep South. The substance-specific origins of at least part of Rule 23 call into question foundational aspects of current class action doctrine. University researchers in the United States seeking to observe, survey, or interview people are required first to complete ethical training courses and to submit their proposals to an institutional review board (IRB). Under current rules, IRBs have the power to deny funding, degrees, or promotion if their recommended modifications to scholars' proposals are not followed. This volume explains how this system of regulation arose and discusses its chilling effects on research in the social sciences and humanities. Zachary M. Schrag draws on original research and interviews with the key shapers of the institutional review board regime to raise important points about the effect of the IRB process on scholarship. He explores the origins and the application of these regulations and analyzes how the rules -- initially crafted to protect the health and privacy of the human subjects of medical experiments -- can limit even casual scholarly interactions such as a humanist interviewing a poet about his or her writing. In assessing the issue, Schrag argues that biomedical researchers and bioethicists repeatedly excluded social scientists from rule making and ignored the existing ethical traditions in nonmedical fields. Ultimately, he contends, IRBs not only threaten to polarize medical and social scientists, they also create an atmosphere wherein certain types of academics can impede and even silence others. The first work to document the troubled emergence of today's system of regulating scholarly research, Ethical Imperialism illuminates the problems caused by simple, universal rule making in academic and professional research. This short, smart analysis will engage scholars across academia. This book is a sweeping and revealing insider look at court history and the life of William Brennan, champion of free speech and public access to information, and widely considered the most influential Supreme Court justice of the twentieth century. Before his death, Brennan granted coauthor Stephen Wermiel access to a trove of personal and court materials that will not be available to the public until 2017. Wermiel also conducted more than 60 hours of interviews with Brennan over the course of six years. No other biographer has enjoyed this kind of access to a Supreme Court justice or to his papers. Justice Brennan makes public for the first time the contents of what Jeffrey Toobin calls “a coveted set of documents,” Brennan’s case histories, in which he recorded the strategizing behind all the major battles of the past half century, including Roe v. Wade, affirmative action, the death penalty, obscenity law, and the constitutional right to privacy. Revelations on a more intimate scale include how Brennan refused to hire female clerks even as he wrote groundbreaking women’s rights decisions; his complex stance as a justice and a Catholic; and new details on Brennan’s unprecedented working relationship with Chief Justice Earl Warren. This riveting information—intensely valuable to readers of all political persuasions—will cement Brennan’s reputation as epic playmaker of the Court’s most liberal era. The book's strength is Wermiel's access to Brennan's private case notes (which are closed to the public until 2017) and dozens of interviews with Brennan himself. The case notes provide a detailed and fascinating account of how the Supreme Court functioned during Brennan's long tenure (from 1956 to 1990) that easily outshines recent high-profile books purporting to break the Court's seal of secrecy. The authors blog about the book here. Excerpts can be found at the Wall Street Journal. Book events are planned in Washington, D.C. at Politics and Prose, Oct. 8; Boston University, Oct. 15, and more. The Center for Cold War Studies (CCWS) of the University of California at Santa Barbara, the George Washington University Cold War Group (GWCW), and the LSE IDEAS Cold War Studies Programme of the London School of Economics and Political Science (CWSP) are pleased to announce their 2011 International Graduate Student Conference on the Cold War, to take place at the University of California at Santa Barbara on April 21-23, 2011. The conference is an excellent opportunity for graduate students to present papers and receive critical feedback from peers and experts in the field. We encourage submissions by graduate students working on any aspect of the Cold War, broadly defined. Of particular interest are papers that employ newly available primary sources or nontraditional methodologies. To be considered, each prospective participant should submit a two-page proposal and a brief academic c.v. (in Word or pdf format) to Salim Yaqub at syaqub@history.ucsb.edu by February 4, 2011. Notification of acceptance will occur by February 25. Successful applicants will be expected to email their papers (no longer than 25 pages) by March 28. The author of the strongest paper will have an opportunity to publish his or her article in the journal Cold War History. For further information, contact Salim Yaqub at the aforementioned email address. The conference sessions will be chaired by prominent faculty members from UCSB, GWU, LSE, and elsewhere. The organizers will cover accommodation costs of admitted student participants for the duration of the conference, but students will need to cover the costs of their travel to UCSB. NOTE: This is a great opportunity for graduate students. I've participated in this conference before. It's a small meeting, and grad students get personal attention regarding their work from scholars in the field. Highly recommended. And what a fabulous location: Santa Barbara! Walter Dellinger, former acting Solicitor General of the United States, shares remarks entitled "September 17, 1787: The Debate Begins," addressing the ratification debates and the enduring significance of the Constitution today -- despite the ongoing debates about the meaning of particular phrases. 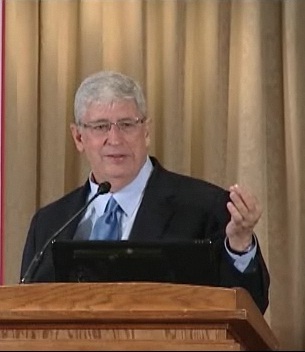 Paul Clement, former Solicitor General of the United States, then provides a response, followed by a question and answer period for those in the audience (both in person and online). The American Constitution Society's report of the event (and the source for the above image) is here. MAKING OUR DEMOCRACY WORK: A Judge’s View by Stephen Breyer is reviewed this weekend in the Boston Globe. The Lucky Ones: One Family and the Extraordinary Invention of Chinese America by Mae Ngai is written with "remarkable -- some might say chilling -- objectivity," according to Carolyn See in the Washington Post. Ngai's new book is also noted in the Los Angeles Times and is recommended reading from the San Francisco Chronicle. THE WARMTH OF OTHER SUNS: The Epic Story of America's Great Migration by Isabel Wilkerson is "extraordinary and evocative"according to Paula Giddings in the Washington Post. THE LAST UTOPIA: Human Rights in History by Samuel Moyn is reviewed in the New York Times. The Casualty Gap: The Causes and Consequences of American Wartime Inequalities by Douglas L. Kriner and Francis X. Shen is reviewed by Andrew Bacevich for The Nation. 1939: Countdown to War by Richard Overy is "ingenious and enthralling," showing that "'nothing in history is inevitable'" writes Geoffrey Wheatcroft in The New Republic's The Book. Meanwhile, the new immigrants kept coming and the immigration inspectors continued tallying them by “race” at the nation’s gates. Given the hostility toward the waves of new immigrants, it’s really a wonder that the gates remained open for as long as they did. Congress tried to shut the gates much sooner. Four times between 1891 and 1917, Congress enacted a stern literacy test intended to keep out the bulk of new immigrants from Southern and Eastern Europe, including, especially, the Jews. And four times Presidents Cleveland, Taft and Wilson vetoed the measures. Teddy Roosevelt kept the literacy test and other harsh exclusionary measures from ever reaching a vote. Party politics kept the gates open. Even when a majority in Congress favored harsh immigration restrictions, neither party could afford to become a national vehicle for anti-immigrant politics. The pro- and anti-immigrant coalitions cut across party lines. The anti-immigration coalition was an unholy marriage of progressive reformers, on one hand, and patrician and plebian nativists, on the other. The latter loathed the new immigrants on racial grounds; the former wanted to stem the economic reserve army of poor newcomers pushing down labor standards. Of course, the racists and labor market types also overlapped. And both included lawmakers with rural constituencies whose native-born sons and daughters were flooding into the same urban and industrial labor markets as the new immigrants: the largest internal migration in U.S. history collided with the largest immigration from abroad. The pro-immigration coalition was an alliance of industrial employers who wanted the gates kept open for cheap labor and the new immigrants’ own political organizations, which could and did sway the presidential election in crucial cities and states. However, if every president until World War I felt compelled to veto the harsh, racially coded restrictions, every president also needed something to offer the anti-immigration crowd. The main solutions took shape under Teddy Roosevelt. Roosevelt learned about them principally from a German-Jewish lawyer named Oscar Straus, the nation’s first Jewish cabinet member. 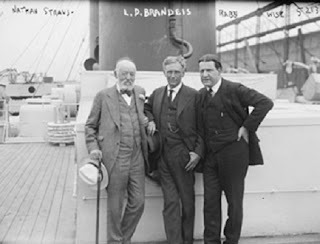 Straus was Roosevelt’s Secretary of Commerce and Labor, where he stood atop the Immigration Bureau. Straus was not only Roosevelt’s go-to guy on immigration policy; he also was a key contributor to what I’m calling the classical liberal variant of American-Jewish identity. "The Politics of Knowledge in Universities and the State"
We aim to convene a multidisciplinary group of intellectual and cultural historians, historians of higher education and the natural and human sciences, sociologists of knowledge, scholars from science and technology studies, students of American political development and political theory, and others in relevant fields of inquiry. The workshop will explore the intersection of knowledge production with political thought and practice, focusing on key institutional sites in higher education and government. How has the authority, and possibly the content, of knowledge been shaped by these political contexts? How have intellectuals engaged with the state and what have been the consequences for public policy and the production of knowledge? How have the institutional politics of universities intersected with the politics of the state? Does it even make sense to speak of “knowledge” and “politics” as distinct entities, or are interpretive frameworks such as “construction,” “co-production,” or “power/knowledge” more appropriate? The workshop will also offer participants an opportunity to think systematically about the historically and socially situated nature of their own scholarly endeavors. We welcome applications for comparative and transnational projects that take North American developments as a point of departure. Fellows will participate in a seminar led by Andrew Jewett (History Department) and Julie Reuben (School of Education), presenting their work and discussing that of invited speakers. Applicants may not be degree candidates and should have a Ph.D. or equivalent. Fellows are Harvard University members with library access, and receive a private office which they must use for at least the nine-month academic year. Stipends are individually determined in accordance with each fellow’s needs and the Center’s resources. 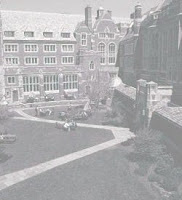 The Center encourages applications, otherwise consistent with the Workshop theme, relating to the nation’s life during and as a consequence of wars, and from qualified applicants who can contribute, through their research and service, to the diversity and excellence of Harvard’s academic community. Application deadline: January 15, 2011. Decisions announced: early March. Obtain an application from the Center (Emerson Hall 400, Harvard University, Cambridge, MA 02138) or our web site. Questioning depictions of the post-Reconstruction federal government as weak, Andrew Wender Cohen argues that although the U.S. government was limited domestically, it was empowered to regulate foreign trade, enforce borders, and assert the nation's economic interests abroad, creating an "outward state." By profiling women, wealthy tourists, Chinese immigrants, and Jews as potential smugglers, customs officials used their authority to define America as a masculine, white, Christian republic. Dinah Nevil's prerevolutionary suit for legal freedom prompted the formation of the world's first antislavery organization. Kirsten Sword reconstructs the story of Nevil's case and the politically driven efforts of a group of propagandists to obscure it. Sword suggests how the legacy of these politically motivated strategic deceptions remains evident in contemporary historical debates about the origins of antislavery, as well as in the differing ways Britons and Americans teach and commemorate antislavery as a social movement. Interviews conducted by the American Freedmen's Inquiry Commission during the Civil War were used to support the commission's policy recommendations during the debates over Reconstruction. Many of the commissioners' recommendations purportedly relied on the testimony of blacks in Canada West. In fact, however, much of the black testimony was ignored in favor of the commissioners' preconceptions. Matthew Furrow contrasts the black interviewees' testimony with the commission's conclusions and examines how political pressures and pseudoscientific racial attitudes undermined planning for Reconstruction. 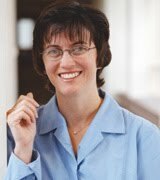 Katherine Turk examines transformations in the structure, tactics, and objectives of the National Organization for Women (NOW). Her analysis of the NOW employment rights campaign against Sears, Roebuck, and Company, which was conceived and driven by the nascent Chicago chapter in the early 1970s and abandoned by a changing national organization several years later, reveals that as liberal feminism grew into a nationally consistent movement, early commitments to local improvisation and socioeconomic justice were lost. Pictured is an illustration from Cohen's article. Its caption reads: "From 1869 to 1874, Special Treasury Agent Benaiah G. Jayne (left) scourged New York importers, confiscating their records in search of evidence of undervaluation. This illustration shows the prominent lawyer William Stanley (sitting right) insisting that Jayne's tactics are unconstitutional. Between the two men is U.S. Attorney George Bliss. 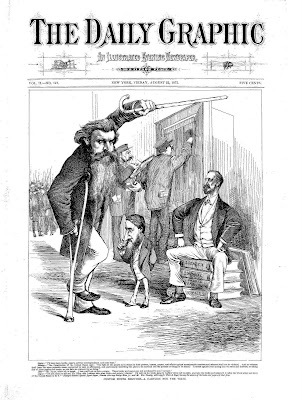 'Custom House Seizures-A Cartoon for the Times,' Daily Graphic, Aug. 22, 1873, p. 361." This paper considers one of the key procedural innovations of the first Supreme Court rules – the making up of the issue - through the lens of the Supreme Court decision in Pharazyn v. Smith (1844). Making up the issue referred to the process whereby pleadings were drafted in conference with the judge hearing the case. 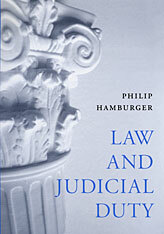 This contrasted with the English system of the time of a series of written exchanges between parties designed to identify the disputed issues of fact and law, and in which the role of the judge was essentially a passive one. Through Pharazyn v. Smith we can see one of the ways in which judges sought to modify English laws to the circumstances of the colony, as well as the judges’ role in shaping litigation, and hence law, in the infant colony. 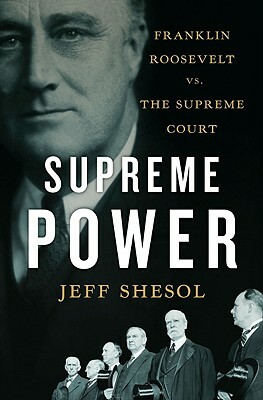 Over at Jotwell, Richard Pildes, New York University School of Law, has published The Court and Politics: What Is the Lesson of FDR's Confrontation with the Court, which is a review of Jeff Shesol's Supreme Power: Franklin Roosevelt's vs. The Supreme Court. His conclusion: "Supreme Power is a galvanizing read, full of arresting detail about a subject I wrongly assumed I knew more than enough about, but it also poses a sobering challenge to the view that the Court is inevitably constrained to be a 'majoritarian' institution." The rest is here.